ATLANTA, Feb. 2, 2017 /PRNewswire/ -- Davis® Brand Capital today released the eighth annual Davis Brand Capital 25 ranking, a global study of overall brand performance evaluating companies' abilities to successfully manage brand value, competitive performance, innovation strength, company culture and social impact. 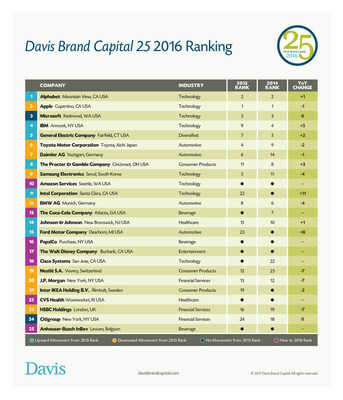 The 2016 Davis Brand Capital 25 ranked companies again beat all public market indexes. A hypothetical stock portfolio of Davis Brand Capital 25 companies would have returned 17.4% in 2016[i], beating the Dow by 2.2 percentage points, the S&P 500 by 6.2 percentage points and the NASDAQ by 7.6 percentage points. After five years atop the list, Apple (#2) lost its number one spot to Alphabet (#1), due in part to Google's increasing dominance and Apple's slowing sales. Microsoft (#3), IBM (#4) and General Electric Company (#5) round out this year's top five. Technology, specifically artificial intelligence (AI), spread across multiple industries. Automotive brands, including Toyota Motor Corporation (#6) and Ford Motor Company (#15), made strides in autonomous vehicle programs. Alphabet's Google Home and Amazon's (#10) Echo brought accessible AI into consumers' daily lives, while Citigroup (#24) explored machine-learning algorithms in banking. Industry rivals had a decisive shakeout on the 2016 list. Daimler AG (#7) beat its Bavarian rival, BMW AG (#12), largely due to the Mercedes-Benz nameplate. The Coca-Cola Company (#13) outperformed PepsiCo (#16), settling the 2016 cola wars. The retail landscape shifted in 2016, with LVMH and Walmart falling off the list entirely, and CVS Health (#22) making its debut. The Procter & Gamble Company (#8), Johnson & Johnson (#14) and Nestlé S.A. (#19) all secured positions on 2016's list, signaling a strong consumer mainstream. "We believe a comprehensive view of brand is most valuable today," said Patrick T. Davis, founder and chief executive officer at Davis Brand Capital. "How talent values employer brands is just as important as how shoppers may prefer one consumer brand more than another. Now, the social impact of a brand is just as important as the financial strength of a brand. Great companies with great brand managers know this, and grow their brand capital across a full spectrum of factors and audiences," he said. 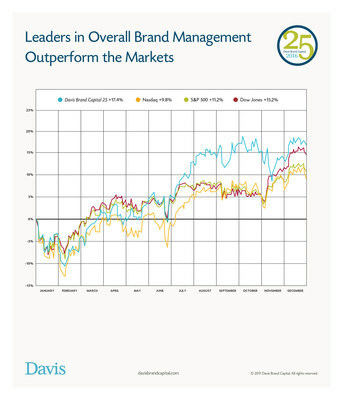 To read the full report of the 2016 Davis Brand Capital 25, visit davisbrandcapital.com. Davis Brand Capital develops, manages, licenses, values and invests in leading brands worldwide. Founded in 1996, the firm is headquartered in Atlanta, with operations in New York, St. Louis and Washington, DC (affiliate). For more information, visit www.davisbrandcapital.com or call 404-347-7778.